Six years after the huge hit that was Wreck It Ralph comes this sequel featuring our hapless hero once again getting into skirmishes in the cyber world. However, as the title suggests – this time his world has expanded beyond the arcade games he lives in and he enters the whole Internet. If you’re not familiar with the first movie don’t panic – you don’t have to have seen that to appreciate this. However, it is quite charming and you could do worse than check it out. This time around Ralph and Vanellope (Reilly and Silverman) are firm friends following their previous adventures and spend every night hanging out in the carious games in Litwak’s Family Fun Center and Arcade which houses their games. However, when a customer breaks the steering wheel on Vanellope’s Sugar Rush driving game it is unplugged leaving all its inhabitants homeless. Learning that there is a wheel available on eBay, Ralph and Vanellope enter the world of the internet to try and source it to save the game. The first movie featured numerous cameos and pop culture references – especially relating to video games – and expanding the world of the movie means they have far more scope for this. Obviously, this is a Disney film so there are plenty of nods to their properties. Star Wars and Muppet franchises both pop up as do many classic Disney characters and of course the Marvel franchise. There is a Stan Lee cameo that while obviously created before his death has an added poignancy now. There is also a hilarious segment involving the Disney Princesses. Most impressively they have actually used all of the original voice casts for these characters where possible. The way they have created the world of the Internet is truly wondrous. The animation is spectacular and the premise works really well. You will find it difficult not to think of this as how your computer really works after seeing this film. All of the voice talent are great and there are an abundance of huge names popping up. Barely a minute goes by where you won’t find yourself realising that you recognise a voice and trying to place it. 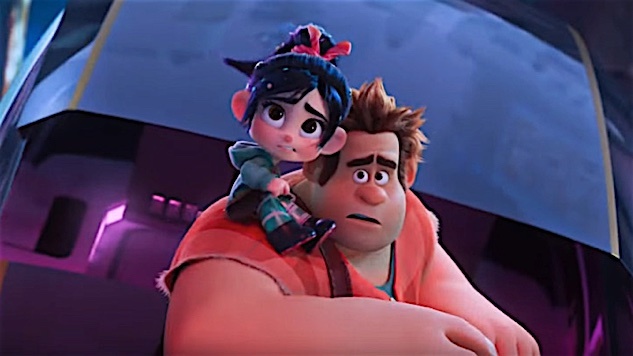 However, at the heart of this film is the relationship between Ralph and Vanellope and for all the colourfulness, it is their friendship that remains key to the story. The underlying message of this film involves how our friendships evolve and change which can often be hurtful at the time but ultimately is a good thing. Although the payoff is somewhat schmaltzy overall this is handled quite well throughout and should resonate with both kids and adults. This manages to show both the best and worst of the internet and leaves you with real food for thought. The kids will love the spectacle while adults will appreciate the reflection of people’s love affair with their gadgets and how it affects their lives. I felt it is a bit on the long side but overall this is a lot of fun and surprisingly thought provoking. It’s not as good as the original but it is still extremely entertaining and should definitely amuse the young and the young at heart.